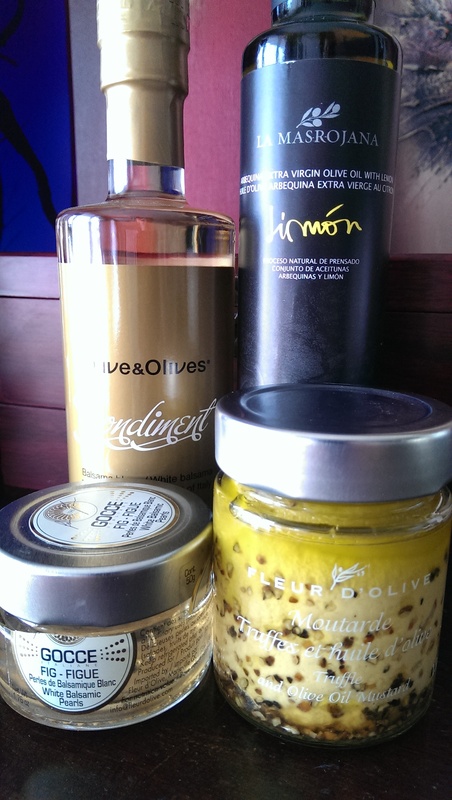 I was just in Olive and Olives yesterday and I think this will quickly become one of my favourite shops. This is their second location in the city and this location has only been open since last October and is located next to the St. Lawrence Market just behind the LCBO. I was all out of Balsamic Vinegar and wandered in. Naturally I picked up a few extras: Balsamic Fig Pearls (can’t wait to use these), truffle oil infused mustard, white balsamic vinegar and a lemon olive oil (memories of Spain..sigh). I was speaking with the owner and will be returning with my camera soon to do an interview (the photo above is just a quick shot from my phone). Posted in local storesTagged balsamic pearls, balsamic vinegar, lemon, mustard, Olive & Olives, olive oil, truffle oilBookmark the permalink. Love the products! I’ve been to your store 3 times now and have never left empty-handed. So many delectable items to inspire new recipes.